What's more awesome than superbikes? 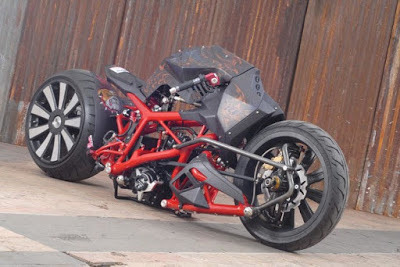 Unique, custom mods of superbikes and other motorcycles that not only change the look of the base motorcycle but also modified the engine power to an unbelievable degree. Another reason why motorheads go for custom mods is they then end up with a vehicle so unique, it catches eyeballs everywhere. Having a beast of a machine that looks or sounds like nothing else is a great feeling. 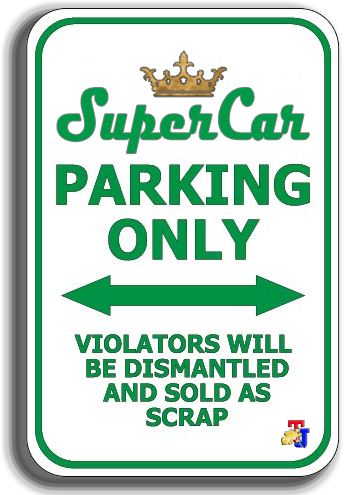 That's why does the people would do this to their beloved rides. 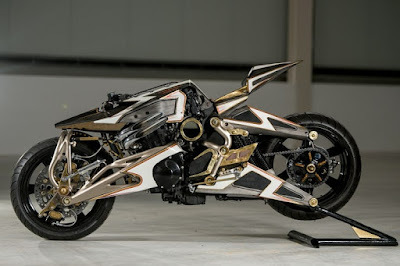 This unique-formed of motorcycle was built by a Manado-based workshop named R1 MotorSport from a 2003 Honda Megapro. 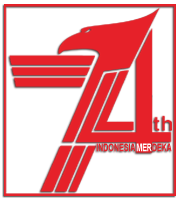 The black colored body motorcycle and red on its frame later became one of the participants of the 2016 Honda Modif Contest. By the theme of Future street fighter, it supported by the main frame construction of 2 inch while for sub-frames used the pipes diameter-size of 1.5 inch and 1 inch. Then the frame directly connected to the front wheels. While for the body, relying on the carbon fiber materials, the shape of the body was made with fully sharp indentations. 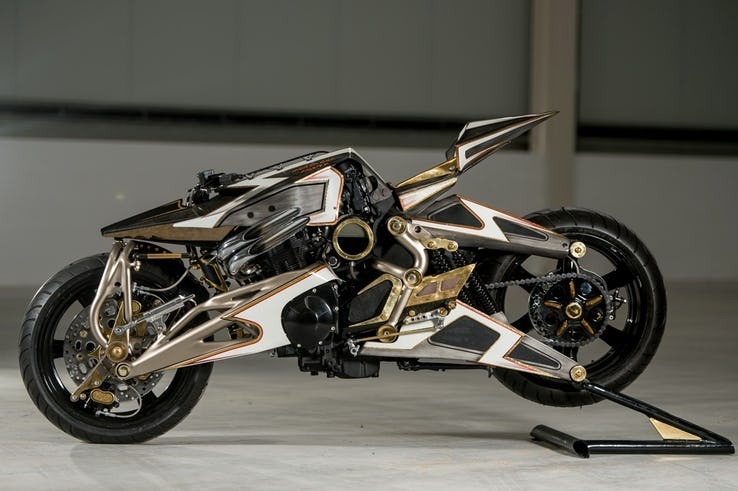 This masterpiece was developed by The Ugley's, a group of Japanese artists, using a Yamaha SR400 chopper as a donor. 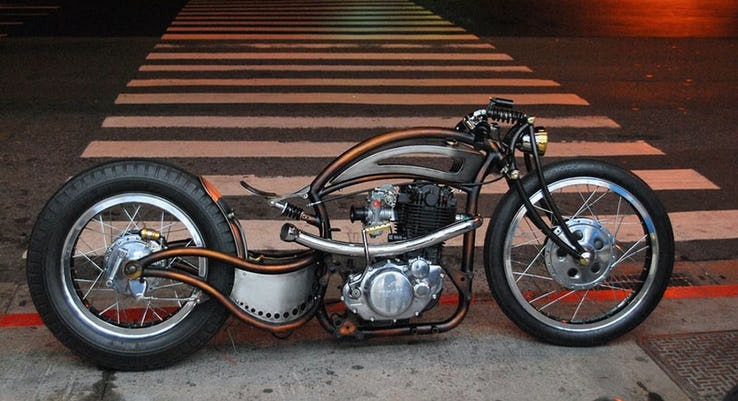 Most of the features on this stunning customized motorcycle were homemade. The Crazy Arc has a homemade fuel tank mounted between the frame tubes, which sort of harks back to the twentieth century's classics. 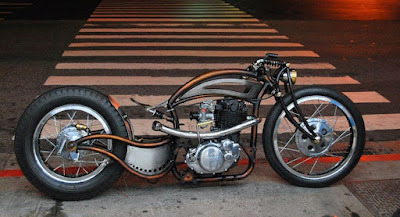 The makers fabricated a custom chassis including the frame, drum brakes, and bespoke wheels. To cope up with the rigid rear suspension, a single seat is fixed on a small damper—but we don’t know how comfortable that is. 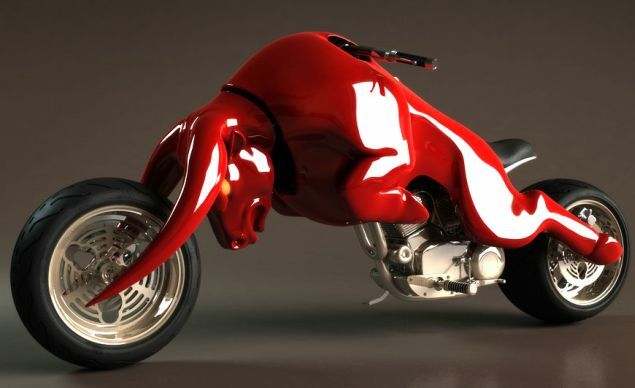 With the look of a street fighter, this edgy mod was designed by Carlos Mortagua of Mortagua Fighter, a Portuguese custom motorcycle company established in 1995. The Disturbed Cadaver has a 1993 Suzuki GSX RX1100 underneath its insane exterior. The custom looks rather futuristic because of its rather "sharp" design. The core of the bike comes from its donor, and it sports a dual paint scheme done by Carlos himself. The entire design took 18 months, so plenty of hard work went into shaping this beastly machine. 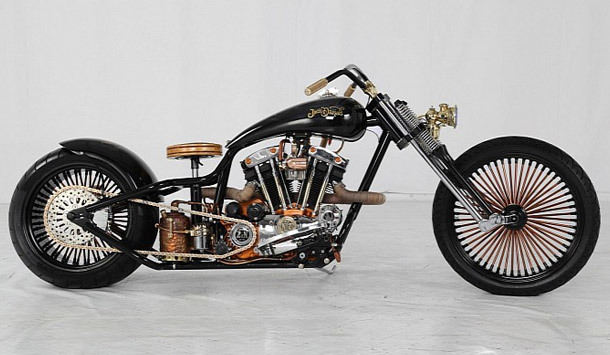 Maybe you will be amazed by this Chopper, because the custom bike is different than others. 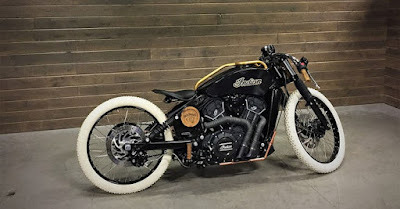 In the hands of Jon Shipley from Hoosier Daddy Choppers, a 1977 Harley Davidson Ironhead Sportster turned out to be the motor that is ready to bulldoze the streets. 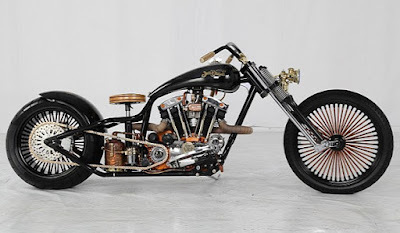 The chopper which takes the famous American alcoholic brand theme that is derived from Bloomfield, a small town in Indiana has managed to bring to life a bike which seems the dream-spawn of a creative steampunk designs. Well, if you're sitting in a bar downing a few and watch this bike whiz by, chances are, you'll think it’s time to hit the road and dump the glass. Why? Because which bike can ever sport not just white-wall tires but actual bright-white tires? Meet these Indian Scout Jack Daniels Edition, it built to celebrate the 150th anniversary of the old faithful No.2 and the 115-year-old heritage of the Indian Scout with a beautiful lovechild. Let's end with "hit the road, Jack…"